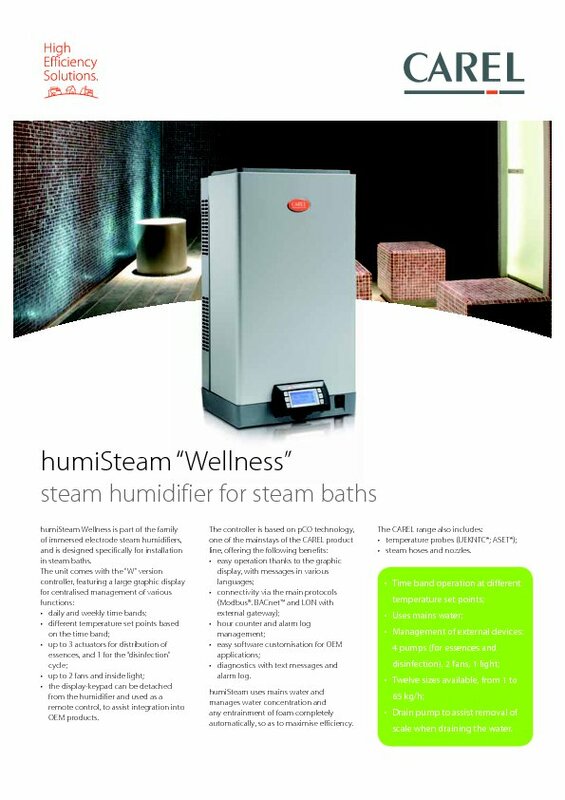 humiSteam wellness (W) has been especially designed to meet the typical demands of steam bath applications, with the software that is able to control different accessories f.i. ventilation, essence pumps (to 3 pcs.) etc. Steam flow-rate is modulated continuously from 20 to 100% of maximum capacity, except in ON/OFF mode, where production is all or nothing. humiSteam Wellness uses mains water and completely automatically manages water concentration and checks for any kind of foam formation, for maximum steam bath safety. He is available in capacities from 1,5 to 65 kg/h.